Inside Line Promotions – NEW RICHMOND, Wis. (July 11, 2017) – Ryan Bowers is back in action with a new team and he is fast. Bowers is racing for the Seidenkranz Brothers, who’ve been racing since the 1950s with their dad. Bowers has raced the last two weekends and led laps during both races. Now they just have to finish the deal. Bowers competed in the support class last Saturday during the World of Outlaws Craftsman Sprint Car Series event at Cedar Lake Speedway. The fourth-place heat race finish lined Bowers up second in the challenge race. Rolling around the track in second place for a handful of laps, Bowers dropped to the bottom to pull a slider and take over the top spot for the win. Bowers felt as though that was one of the best races he’s ever been in. Bowers is scheduled to return to action on July 22 at Wagamon’s Ogilvie Raceway in Ogilvie, Minn., with the UMSS Series. July 8 – Cedar Lake Speedway in New Richmond, Wis. – Heat race: 4 (8); Challenge Race: 2 (1); Feature: 3 (2). K1 Racegear is a manufacturer of technical, high performance auto and kart racing gear. For more information, visit http://www.K1Racegear.com. Bowers would also like to thank Mastell Brothers Trailer Service, Hilltop Camper and RV, Farmers Insurance Jeffrey Greene Agency, GRP Motorsports, Champion Helmets, Speedwerx, Racecoatings, Elevated Health Center and Liquid Nitro for their continued support. Inside Line Promotions – NEW RICHMOND, Wis. (May 10, 2017) – Ryan Bowers was able to turn bad luck into the Hard Charger Award last Saturday at Cedar Lake Speedway. Bowers and the Ozzie Motorsports team were unable to finish the heat race because the wreck bent the front axle and tore out the rear end. Scrambling to get the race car back together, Bowers had the help of many people. Bowers started 22nd and drove his way up to ninth before the checkered flag was waved. However, to his advantage, a car in front of him was disqualified and Bowers was awarded an eighth-place finish. That also earned him the Hard Charger Award for passing the most cars. Bowers was supposed to start a two-race weekend with the IRA Sprint Car Series on Friday at Oshkosh Speedzone Raceway in Oshkosh, Wis. However, the water truck dumped too much water onto the track and after hours of trying to run it in the race was cancelled. 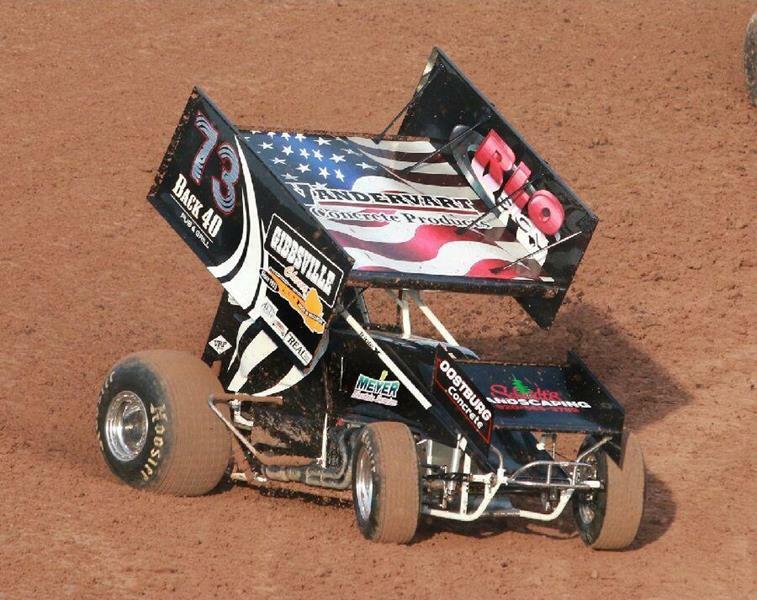 The team will travel to Beaver Dam Raceway in Beaver Dam, Wis., this Saturday with the IRA Sprint Car Series. Bowers is tied for ninth in the championship standings. May 6 – Cedar Lake Speedway in New Richmond, Wis. – Qualifying: 11; Heat race: DNF (1); Feature: 8 (22). Jeffrey Greene is a Farmers Insurance agent in Maple Grove, Minn. For more information, visit https://agents.farmers.com/mn/maple-grove/jeffrey-greene. Bowers would also like to thank Mastell Brothers Trailer Service, Hilltop Camper and RV, GRP Motorsports, K1 Racegear, Champion Helmets, Speedwerx, Racecoatings, Elevated Health Center and Liquid Nitro for their continued support. Inside Line Promotions – HAM LAKE, Minn. (Nov. 7, 2016) – Ryan Bowers is excited to announce that he is partnering with Ozzie Motorsports to tackle the IRA Sprint Car Series in 2017. It will be the first time for both Bowers and Ozzie Motorsports to run with the 410ci winged sprint car series on a full-time basis and the goals are lofty. Bowers has a pair of 410 starts under his belt as he hopped in the Ozzie Motorsports race car twice in 2016. The first time ended with a 21st-place result with the most recent race providing a 12th-place finish. Bowers said he will also compete in several events in a 360ci winged sprint car owned by Mastell Brothers Racing. The team has recorded 11 feature victories during the last three seasons and has won the past two Upper Midwest Sprint Car Series championships. “For anyone that wants to race sprint cars, 410 is the highest stepping stone,” Bowers said. “It definitely gives me confidence having run twice. It takes everything to make the car go fast and being able to get a couple of races under our belt will be a huge advantage. I’m excited about the opportunity. Mastell Brothers Trailer Service, Inc., which is based in Columbus, Minn., has become the upper Midwest’s largest and most respected sales, service and rental provider of all types of trailers to multiple industries. The company sells a comprehensive line of trailers and parts (new and used) from the Industry’s most respected brands as well as its own unique designs and offerings. For more information, visit http://www.MastellBrothers.com. Bowers would also like to thank Farmers Insurance Jeffrey Greene Agency, Hilltop Trailer Sales, Con-Tek Machine, Jeff Westall Outdoors, GRP Motorsports, Fastsigns Brooklyn Center, K1 Racegear, Champion Helmets, Speedwerx, Racecoatings, JAG, Elevated Health Center, Liquid Nitro, Walker Performance Filtration, R&M Race Trailers and Octane Ink for their continued support. It was nice meeting you, and hope to see you at the races!